After drooling over Jamie Oliver's BBQ on Jamie At Home last week, we just had to use the opportunity of what felt like the first and what could have been the last of the 2007 summer to try out his delicious marinade recipe. I crushed the cumin seeds, cloves, paprika, fennel seeds, rosemary, thyme, garlic, pepper and salt, then mixed with red wine vinegar and tomato ketchup. Unfortunately we do not have any independent butchers nearby so we had to settle with pork ribs from Asda (don't even get me started on the state of supermarket meat). I rubbed in the marinade and left in the fridge for a few hours. These were accompanied by my homemade beef burgers - yum! We still haven't got round to buying a barbecue, at first we toyed with a gas one, then came back to the idea of traditional charcoal, looking at a classic Weber, but we didn't like the size and the circular shape, plus it would be good to have something we could take camping as well as our stove. The funky versatile Son of Hibachi would be just about right, and I've found one for £49 inc. delivery. Our (very) brief summer is probably over now though, so a party sized instant BBQ had to suffice. All in all a scrumptious outdoor feast! For some reason, out of all the herbs I have planted, my flat leaf parsley has really flourished. Trouble is, I have no idea what uses it has. As it turns out, someone else has the same problem. Now, I have two good ideas: tabouleh and parsley pesto. I tell you what, this company has got it going on. I have never been a Sky customer before, but a couple of weeks ago we made a double leap to subscribe to Sky+ and it's like we've entered another world! I love it that when I want to top up my wine or pop to the loo I can pause live TV, and that when Location Location Location is on one side and Rick Stein is on the other I can record both. I love it that I don't have to watch London Tonight and count the stabbings because the satellite has picked up where we actually live and sends us South East Today. In fact, if I wanted to pretend I was in Newcastle I could even tune in to North East Tonight. And it was so easy. I signed up online, I chose a date for the install, three days later I received letters confirming the subscription and the install. The night before the install was planned, Bob, the engineer called to let me know we were his first call and he'd be there at 8.30am. Bob turned up, he was friendly and polite, he gave us a quick demo and we were away! Last night I received a call from Sky to check that I was satisfied. I told them how impressed I was. Then, as if this magic TV wasn't enough, the nice lady told me about some of the extra features. Did I know that I can order a Dominoes pizza from my Sky box? Did I know that I can buy a lottery ticket from my Sky box? How cool is that?! Then I went exploring for games and there's a bazillion of them! Great product and excellent customer service - what a refreshing change! The other night I watched the first of the new series, Jamie At Home and boy was it good. Don't get me wrong, I fully support Jamie's mission with school meals and I enjoyed Fifteen, but it was much more satisfying just watching him cook instead. The first episode focussed on tomatoes and he really had me salivating. Can't wait for next week! As if I hadn't had enough culinary inspiration, last night began Rick Stein's Mediterranean Escapes. WOW. Rick can sometimes be a bit fishy for me, but the Corsican goat kid with roast figs and tomatoes and the Sardinian pasta dishes were drool-city. 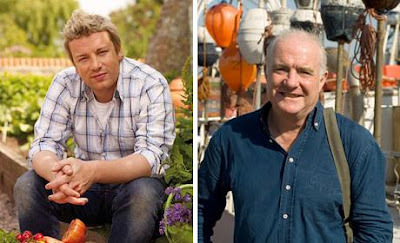 The combination of travel and food around the Med is going to make for a great series. Dom's birthday hog roast passed in a blur. The food was fantastic, there was music, fireworks, dancing, large amounts of booze and thankfully, fair weather that held out until about 8pm when we all crammed into the gazebo. I had such a bad hangover the next day!